Through the good and the bad, God wants us to rely on Him in every situation. 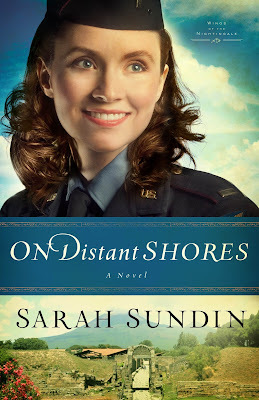 Never was there a time so tenuous and uncertain as the battlefields of WWII, the setting for Sarah Sundin’s newest release in the Wings of the Nightingale series, On Distant Shores (Revell/August 15, 2013/ISBN: 978-0-8007-2082-7/$14.99). Sundin explores the uncertainty we face when life doesn’t go as planned, emphasizing the need to turn to God always. Sundin fittingly chose James 1:5-6 as the theme for the story: “If any of you lack wisdom, let him ask of God . . . and it shall be given him. But let him ask in faith, nothing wavering. 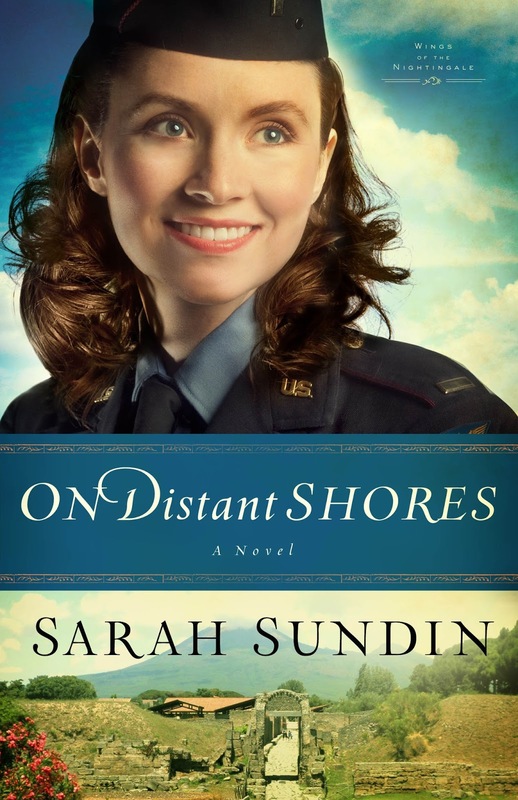 For he that wavereth is like a wave of the sea driven with the wind and tossed.” With her eye for detail and flair for romance, Sundin weaves a captivating tale of two souls looking for peace in a time of conflict. Q: The Wings of the Nightingale series is your second series set during World War II. What is it about this time in history that holds your fascination? Do you plan on writing about any other time periods in the future? So much about the World War II era appeals to me — the music and fashions, the adventure and drama, and the inherent romance of living in uncertain times. Also, the vast scope of the war inspires countless story ideas to explore. I do plan to keep writing about World War II — at least for the next three years. I recently signed a contract with Revell for another series, tentatively called Waves of Freedom, which follows three naval officers based in Boston in the early years of the war. Q: If you could go back in time to any period, when (and where) would you go? As much as I enjoy reading and writing about World War II, I don’t know if I’d want to live back then. I’d pick a gentler time, like the immediate post-war years into the 1950s. Q: You include a lot of specific details in your novels. What did your research process look like for the Wings of Nightingale series? Research for this series has kept me hopping! I’ve read everything I could find about the flight nurses, the battles in the Mediterranean area and medical care in the war. One of my favorite finds is the complete unit history of the US 93rd Evacuation Hospital, where Hutch, the hero of On Distant Shores, serves as a pharmacist. Not only did it include the extensive movements and work of this mobile hospital, but it included stories and lots of pictures. Q: Have you been able to travel to any of the locales featured in this series? If so, where to and where were your favorite places to go? I have! In the summer of 2011, my family visited Italy and southern France. I felt the sand of the beaches of Salerno and Anzio between my toes, heard the thrum of the cicadas among the ancient Greek temples at Paestum, balanced on stepping-stones in the roads of Pompeii, braved the hair-raising traffic of Naples and ate plenty of authentic pasta and pizza. Thanks to “Learn Italian While You Drive!” CDs, I bumbled my way through a conversation with a delightful museum docent in Anzio and amused countless merchants and cashiers with my pidgin Italiano. I loved everything about the trip. Q: What is the main spiritual message you hope readers will take away from On Distant Shores? The theme verse is James 1:5-6: “If any of you lack wisdom, let him ask of God . . . and it shall be given him. But let him ask in faith, nothing wavering. For he that wavereth is like a wave of the sea driven with the wind and tossed.” Social butterfly Georgie has always turned to others to make decisions, but she learns to turn to the Lord for wisdom and not to waver in fear. Also Hutch battles with bitterness when his goals are thwarted at every turn, and he learns to be content where he is: “Whatsoever ye do, do it heartily, as to the Lord, and not unto men,” Colossians 3:23. Q: What are some of the challenges your main characters Georgie and Hutch face, and what do they learn from them? One of the chief problems they face is that Georgie, as a nurse, is an officer, and Hutch is enlisted, despite his bachelor’s degree in pharmacy. Not only are they not allowed to fraternize, but she outranks him. Nowadays the economic downturn has produced many families where the wife out-earns the husband, which can cause problems in the relationship if not handled with care, respect and humility. I hope Georgie and Hutch’s struggles with this situation will resonate with readers. As the baby in her family, Georgie is used to depending on other people to help make decisions. In the course of the story, she learns to turn to the Lord for wisdom and guidance and to overcome her fears. Meanwhile, Hutch deals with the frustration of thwarted dreams. When should we keep fighting for our goals? Is it ever best to surrender? Q: Hutch faces some disrespect and difficult coworkers in his position — how should we handle tension in the workplace? Since I work on-call in a hospital pharmacy, I witness workplace tension firsthand. Things work best when people go out of their way to understand and respect one another. Assuming the other person has good motives — even if you disagree with the means they’ve chosen — goes a long way. You get into trouble when you begin assigning bad motives to one another. Also it’s vital to treat co-workers with basic courtesy and respect, even if you don’t like them as a person. Because, shockingly, that happens. These are lessons Hutch learns in the story. Q: Friends play a major role in On Distant Shores. What qualities do you believe make a good friendship, and what can we learn from the relationships within the story? I’ve had more fun watching the friendships grow in this series. At the beginning, they have so little in common, but by the end, they’re closer than sisters. The women are so different, but that’s their strength. They complement each other and enjoy the differences. They know when to encourage and when to confront, when to push and when to let up. Q: Both of your lead characters come to realize that dreams change — how have your dreams changed? I never seriously pictured myself becoming an author when I was growing up, no more than becoming a ballerina. From sixth grade on, I was drawn into science, ending up as a pharmacist. I loved pharmacy and never imagined wanting to do anything else . . . until the year 2000 when a story idea hit me and wouldn’t let go — and my dreams shifted. Q: Many of the characters in your books are pilots, flight nurses or deal with planes in some form. Are planes a hobby of yours? Do you have a background in the medical field? I’ve had a lifelong love affair with planes. My father traveled a lot on business, and the whole family would take him to LAX. It was all so exciting — the glamorous stewardesses, the travelers with their fascinating languages, even the smell of the airport. And oh, the planes! I’ve never learned to fly (or even wanted to), but I’m an enthusiastic traveler and was privileged to experience a flight in a restored B-17 Flying Fortress. What a ride! 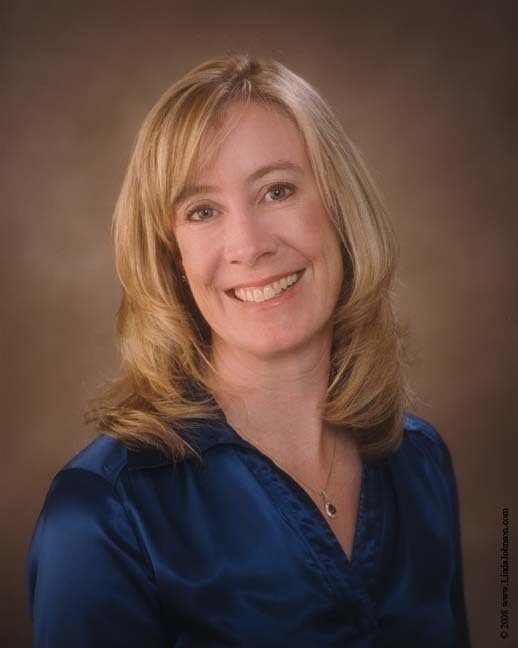 Yes, I do have a background in the medical field; I have a doctorate in pharmacy. My scientific and medical training helped me write this series, from understanding nursing procedures and medications, to understanding the medical texts of the time period, to deciphering the pilot’s manual for the C-47 cargo plane. Q: You didn’t become a writer overnight. What was your journey like that brought you to where you are today? One of the reasons I chose pharmacy as a career was the opportunity for part-time work, since I wanted to be a stay-at-home mom. In 2000, when my children were little, I had a story idea and started writing. That first novel was really bad and will never be published (please), but it got me started. I began attending a writers group and writers conferences. In 2003, I began submitting to editors and agents, which led to a five-year run of rejection letters. I used those years to keep learning, growing and writing. In 2008 at Mount Hermon Christian Writers Conference, I submitted A Distant Melody to Vicki Crumpton at Revell, and a few months later, Revell offered me a contract for my first series, Wings of Glory. Since then I’ve been busy making the transition from hobby writer to full-time professional writer. Q: Can you give readers a sneak peek at what’s to come in the next book in the series? In Perfect Time comes out in August 2014. Flight nurse Lt. Kay Jobson collects hearts wherever she flies, but C-47 pilot Lt. Roger Cooper is immune to her charms. Throughout Italy and southern France, as she evacuates the wounded and he delivers paratroopers and supplies, every beat of their hearts draws them where they don’t want to go.